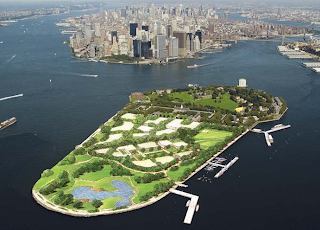 If you've ever visited Governors Island - that little oasis of quiet set off the southern tip of Manhattan in New York Harbor - you know it is a great idea for a nice day out. And, here is an idea for you and the kids to now have an excuse if you haven't yet visited the island. The Governors Island Art Fair takes place over every weekend from this weekend, the 5th of September until the 27th. It is estimated that over a hundred artists from around the world will be showing their work, which runs from painting to sculpture to video and installation to puppets! It is easy to get to the island from a ferry either from Manhattan or Brooklyn and you can either bring your own bike, or it's possible to rent one from the island. Have a look at some great art and take a bike ride around - do some fishing, or just sit on the grass and believe you are hundreds of miles away from the hustle and bustle. The perfect way to allow yourself to think the Summer is still going strong! For more information visit the Governors Island Art Fair site or you can get more info about Governors Island itself here.